Deena Bronz is the co-founder of KitNipBox, a curated monthly box of cat products, including toys, treats, accessories and even Halloween costumes. Deena shares her advice for finding the right product or service to offer, building a community for the members, and focusing on retention. The single most important question to answer before launching any subscription service, including subscription boxes, is, “Who is my target customer?” While most start-ups fall in love with their product, service, SAAS tool or the contents of their box, the smartest start-ups focus on their target customer instead. Then, they create a product that meets the needs and wants of that potential subscriber. Member retention involves staying engaged with the customer as well as continued attention to your product or service. “If you don’t have a wonderful and joyful unboxing experience, and if both the owner doesn’t feel that there’s value and quality there and the cat doesn’t engage with the item, then you’re going to lose that customer sooner rather than later,” Deena warns. Discover How to Turn Gift Subscriptions into Customers! Your three keys for maximum subscription growth are a focus on your target customer, delivering a great product experience for your customer and engage subscribers in a vibrant tribal community. * Subscription Economy: the term “Subscription Economy” was created in 2007 by Tien Tzuo, Founder & CEO of Zuora, Inc. Learn more about building a successful subscription business from Deena’s interview on Membership and Subscription Growth. 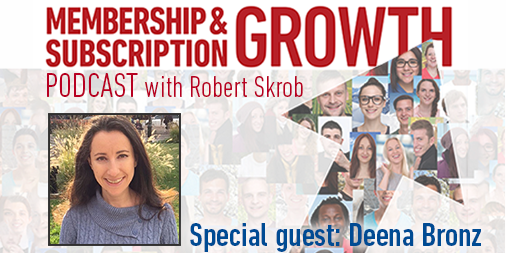 To continue to get membership and subscription growth insights as well as advice from some of the most successful entrepreneurs in the subscription economy, subscribe to the podcast Membership and Subscription Growth.